Pine Bark Extract with Vitamin C, Grape Seed Extract & Rutin. 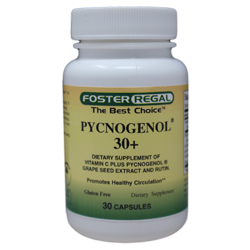 Pycnogenol is water soluble, super potent and absorbs quickly. Pycnogenol is a formidable antioxidant, in vitro tests indicating that as a free-radical scavenger the substance is 20 times more powerful than vitamin C and 50 times more effective than vitamin E.
Pycnogenol is a natural plant extract made from the bark of the European coastal pine. It grows along the coast of southern France, from Bordeaux to the Spanish border. Other ingredients: Veg. cellulose, gelatin, calcium carbonate, magnesium carbonate, veg magnesium stearate. Directions: As a dietary supplement, 1 to 3 capsules daily.